Fun With Frisian: FERHÚZJE - "to move"
Happy New Year! This year started off with a bang. I am in the middle of the topic of this lesson: moving! Ferhúsdei is "moving day." 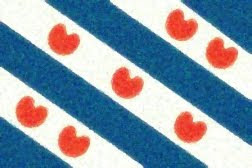 From previous lessons, remember that the Frisian word for "day" is pronounced like the word "dye" [DIGH]. Another word meaning "to move" is bewege, but that is more about physical motion or changing a state. Of course, when you move you are surrounded by boxes. Two words to be familiar with are de doaze [duh DOH-zuh] and it kistje [uht KISH-juh]. The second word seems to refer to small boxes, including ones for jewelry, crates, and also to coffins. The first one is more what we usually have in mind when we speak of boxes. You can see a video and an article about a bunch of boxes that were spilled in Ljouwert at http://www.omropfryslan.nl/nijs/frachtwein-ferliest-doazen-op-ljouwerter-kruspunt. Ik soe ferhúzje nei Dokkum. I'd like to move to Dokkum. Mar ik kin noch net ferhúzje. But I can't move now. / But I still can't move.